Last week we showed how incredibly strong and light a material like aluminium can be when it’s been extruded into a square section and then had plenty of lightening holes strategically drilled. 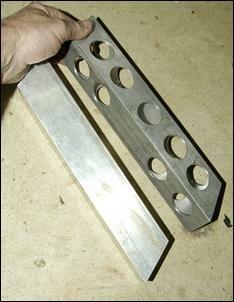 The use of aluminium and lots of holes is a technique equally applicable to brackets, supports or anywhere that you want strength, lightness and a cool appearance. But how do you make it all happen? It’s straightforward, even with only hand tools. 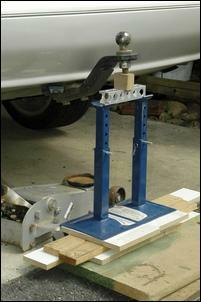 However, a belt sander, bandsaw (or electric jigsaw) and a drill-press make it a lot easier. Aluminium is easy to cut, file and drill; it’s available in a huge range of sections and sheet; it looks good and doesn’t rust – but it can also be painted or powder-coated. About the only downside is that to weld it, professional TIG (or at a pinch, MIG) equipment and skill are needed. However, if you can find a welder who works from his home (perhaps after hours), even the cost of welding can be brought right down. Most aluminium that I buy is from scrap metal merchants. Offcuts of extruded sections (the most useful being 90-degree angle; and round, square and rectangular tube) and sheet can be had for scrap price if you drop into metal recyclers frequently. Manufacturers that use large amounts of aluminium will have their own scrap bins and you can also buy from these. If worse comes to the worse, buy the aluminium brand new. However, be prepared for a shock – the new price can be something like five times (or more!) the price of the scrap! The benefit of buying new is not that it is new (who cares?) but that you can buy the material in exactly the size you want. For example, the 40 x 40 x 3mm aluminium tube that starred last week in the car lifting test was originally bought as scrap. But after a few constructional mistakes were made, more was needed – and was purchased new at about AUD$25 a metre. The original probably cost about 25 cents per metre – but admittedly in lots of shorter bits. Talking about tube, the strength of the material (especially in bending) goes up very quickly with increases in depth or diameter. In other words, a 50mm tube is much stronger than a 25mm tube, even with both having the same wall thickness. Not mentioned here is the grade of material. Aluminium is available in many grades, each with different strengths. However, as discussed in Part 1 of this series, the benefits of good structural design apply irrespective of the material being selected. So in the project which can be occasionally seen in this series (a human-powered vehicle), I concentrated on the best design I am capable of – and used whatever grade aluminium I could get my hands on. As we saw last week, making holes in the right places can result in very little loss of strength but quite a loss in weight. How much weight loss, then? This square aluminium tube (50 x 50 x 3mm) dropped from 410 to 300 grams, a reduction of 27 per cent – and you can see that the drilled tube isn’t fully drilled because extra strength was needed at some spots. 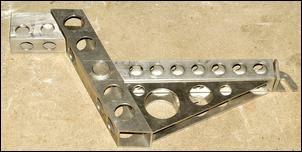 This drilled sheet aluminium gusset dropped from 140 to 100grams, a weight saving of 29 per cent. Incidentally, despite visually taking up quite a lot of space, a gusset (always used so that its longest edge is in tension) weighs very little while providing a potentially enormous increase in strength. OK, so how do you drill the holes? I write this after drilling several hundred holes in 3mm aluminium over the last three days. And there’s a lesson I have learned: it is very easy to make mistakes and so ruin the part you are making! If that happens after you’ve been working on it for three or four hours, it’s not much fun. Firstly, if you want a good result, accurate marking-out is absolutely critical. In fact, it’s best to sit down, take it easily and fully mark out the piece of work before you let it anywhere near a drill press. If you’re working with square tube, making things harder is that it’s likely that the hole spacing will not be the same on each of the four walls. That’s because if the ends of the tube are mitred, two walls will be shorter. Or if, part way along its length, the tube is going to be welded to another tube, there will be less space on that wall for the holes. Hmmmm. So let’s take a look at a procedure that is effective and relatively easy, allowing the number and spacing of the holes to be matched to available square tube wall length. Step 1 – Scribe a line down the exact centre of each wall of the tube. If you have a pair of digital calipers (very useful in this work) you can use the hardened jaw to scribe the line. Measure the width of the tube and then set the caliper to exactly half that. Place one jaw so that it’s just overhanging the side (but snug against it) and place the sharp inner edge of the other jaw on the wall of the tube. If you angle the calipers and draw them along, a line will be faintly scribed down the centre. To check your accuracy, turn the tube around and mark it again, this time using the other wall as a guide. If you’ve got it right, the two scribed lines should be on top of each other. Step 2 – Measure the length of the wall that you have to put holes in. Make sure that you first think about whether you really want holes all the way along – are other tubes going to be butting up against the wall of this one? 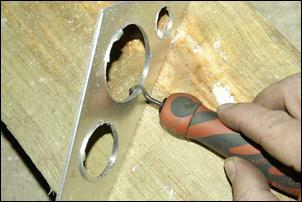 Do you need to leave ‘meat’ for bolt holes? Once you start making a hole you’re committed! 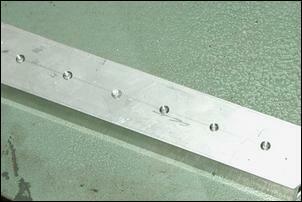 Step 3 – Using a hole-saw, cut a hole in a scrap piece of material of the same dimensions. Then, using the calipers, measure the actual diameter of the hole. This is important because a hole-saw, unlike a drill bit, makes a hole that is larger than its body diameter. Also check that the hole size you’ve selected is appropriate for the application – that there’s still plenty of material left where it should be. Step 4 – You should now have two dimensions – the length of the wall in which the holes are going to be made, and the actual size of the hole. Let’s say the wall length is 176mm and the hole size is 23mm. Using a coin (or anything else of about the right size) as a rough template, you should be able to see that probably five 23mm diameter holes will fit in this length with plenty of material left between them. Step 5 – So, five 23mm diameter holes (ie 5 x 23 = 115mm) in a length of 176mm gives 61mm left over. Now this 61mm has to provide six spaces (always one more than the number of holes) and 61mm divided by 6 gives 10.2mm of metal between each hole, and 10.2mm of metal between the end holes and the ends of the tube. Step 6 – To mark the first hole, add the figure for the amount of metal between each hole (in this case 10.2mm) to half the radius of the hole (23 divided by 2 = 11.5) to give a total of 21.7mm. That’s the distance from the end of the tube that is the centre of the first hole. So follow down your pre-marked centre line until you get 21.7mm along from the end. Again, it’s easy if you use the calipers as a combination scriber and divider. At this point mark a line across the centre line. 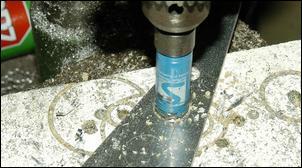 Step 7 – To mark the second and subsequent holes, add the diameter of the hole (23mm) to the width of the material between holes (10.2mm) and set the calipers (or dividers) to this distance – in this case, 33.2mm. You can then mark off each of the rest of the holes, spacing them one after another at this distance. When you get to the last hole, the distance between its centre mark and the end of the tube should be the same as the spacing to the first hole at the beginning of the tube – check to see if this is the case. 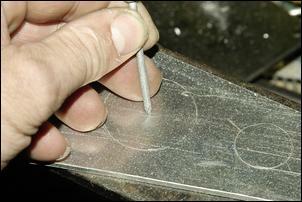 The first step in drilling the holes is to use a drill bit to enlarge your centre punch marks. That drill bit can be a separate drill or the one that centres the hole-saw. In either case, use the drill to just touch the surface of the work – only enough to make an unambiguous starting point for the drill. Do this with on each of the centre-punch marks and then remove the work from the drill press. Any misaligned holes will now be clearly visible, and if present, it’s not too late to redo the centre-punching and so make the drill start in a slightly different place. The next step it so drill right through with the pilot drill. After doing this, spray some lubricant on the hole-saw and material – with aluminium, a penetrating lubricant like RP7 or WD40 (where do they get these names from?!) works well. Then cut the hole, lifting the hole-saw frequently to clear swarf and lubricating as necessary. 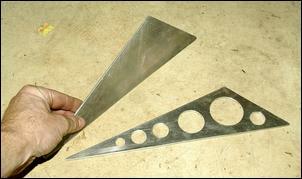 A chattering saw blade will give a poor result, and in extreme cases the resulting hole will not be round. If you are drilling through sheet, make sure you place a piece of scrap timber beneath the panel. Very thin panels that vibrate when cut can be clamped between two layers of plywood and the hole-saw used to cut through the lot. The hole-saw will make a bit of a mess of the rear side of the sheet, or the inside of the tube. Use a de-burring tool to remove the dags and also give a good-looking radius’d edge. These handheld tools are cheap and are available from major tool retailers and industrial suppliers. As when doing all this work, wear eye protection.